Easy to entry TAO II world! *This products doesn't have Brain unit (Bluetooth connect device). *You will be able to add Brain unit anytime. An effecter for exclusive use of TACHYON AIRIA. 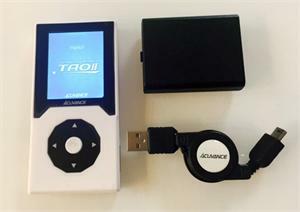 In addition, TAO II can display the change of various data** on a running vehicle. It adopts the aluminum panel of the champagne gold on the main body back. You can easily confirm each setting data via 2.2inch TFT color LCD. 3. Touch scroll button. It’s the first among this industry. By the use of the wheel pad, intuitive operability greatly improved. 4. Large expansion of the E.S.C. setting points. TAO II enlarged a menu that more detailed setting was enabled. In this way, it can show enough AIRIA original performances. It can completely set each frequency to greatly influence operation feeling independently. The set point came to be largely and more detail. 1 - 2KHz step in 0.5KHz or 1KHz - 32KHz. It has 11 kinds of setting items by boost and turbo function. Because we made many set points in detail, you can set strong acceleration and the slow control freely. You can set the upper limit of the motor RPM. It has five kinds of programs to pre-set according to a category. Because you can change all parameters depending on preference from each program to pre-set, you can do setting easily. 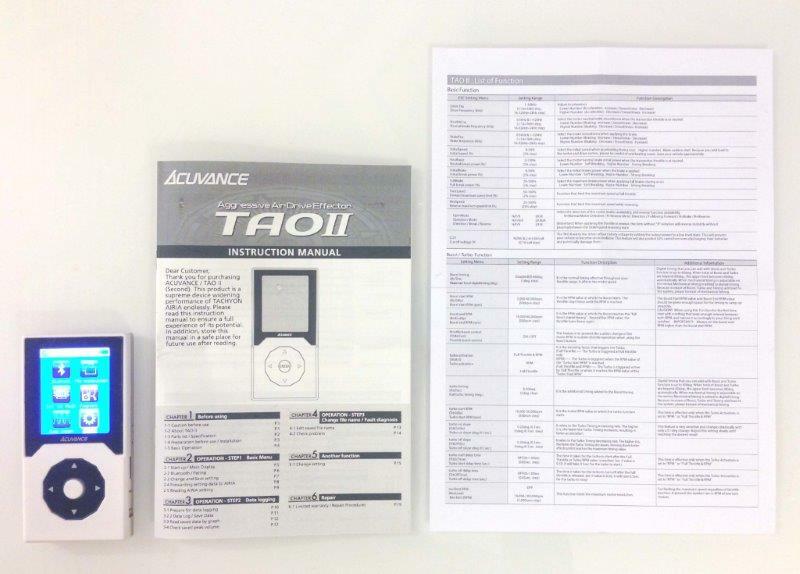 You can transmit the contents which you set in TAO II to AIRIA via Bluethooth.In addition, you can confirm a set point on current E.S.C. with a screen of TAO II through Bluetooth. 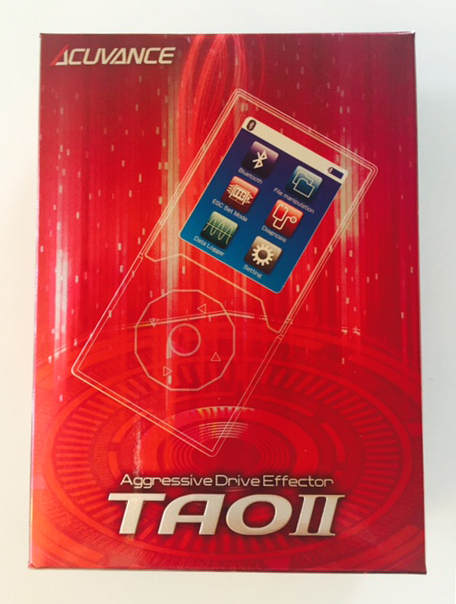 When battery voltage or motor temperature arrived at the value which you set beforehand, TAOII vibrates and notices a driver to avoid trouble. Various temperature, Battery voltages, Motor RPM, Throttle work etc. In addition to current data, TAO II displays graph data the last 3 kinds at the same time. Because you can easily compare the change of the running condition by this function, you can confirm various hints for an driving level or improvement of the time at hand. 10. Micro SD card for memory media. It memorizes various set points and data using bundled 4GB Micro-SD Card. Therefore, the exchanges of the data between drivers were enabled after being able to record information approximately endlessly. TAOII can do the setting and the data log of multi RC cars through Brain unit. They have 2 ways connection method with Brain Unit and AIRIA. Because the connection is possible in separate with attached L shape connector cable other than a docking system too, you can choose a mounting place freely. Furthermore, you can control various expansion devices that planned release via Brain Unit in future with TAOII. You have to use a temperature sensor unit sold separately for the motor temperature detection.